Manchester United manager, José Mourinho has stated that he will not celebrate Manchester United goals anymore, which has led to speculation that the Portuguese manager is still perceived as protesting silently against the lack of support in the wake of him criticising the manner in which Manchester City celebrated their win at Old Trafford. The United boss was unmoved when Romelu Lukaku opened the scoring at The Hawthorns in our 2-1 win against West Brom, and has stated his reason for his lack of emotion for the strike by the Belgian. Lukaku also failed to celebrate when he scored in the 1-0 victory over Bournemouth last week, as the atmosphere has looked dour for us in recent weeks. With Manchester City winning emphatically against Tottenham, Manchester United knew that we had to win the game against Alan Pardew’s team to stand any chance of winning the team. Mourinho has claimed that he didn’t celebrate because he felt that at 1-0, there was still a lot of football to be played. “You get more experienced, you get more balanced. You don’t go crazy when you win. You don’t get depressed when you lose. You are much more stable with experience. Some other managers, they are different, and they don’t change.” He added. 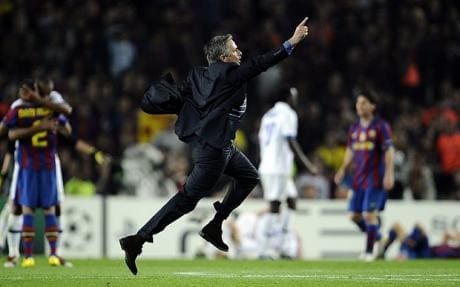 Mourinho, in his younger years was always known to celebrate wins and goals in excessive fashion. Back in 2004, he slid off the turf at Old Trafford when Porto won the knockout tie against United but he took exception to how Antonio Conte celebrated Chelsea’s 4th goal in a 4-0 drubbing of Manchester United last October. His famous moment came when Inter won against Barcelona in the Champions League semifinal back in 2010, as his celebrations were aimed at angry Barcelona fans who were booing him.